We run regular new paddler sessions. 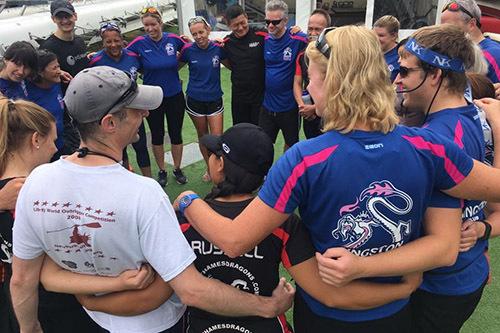 On the day, you will be met by one of the team who will give you a safety briefing and a brief overview of the session, including an introduction to our paddling technique. All of our training sessions start with a land based warm up followed by a team brief from one of our coaches. We will then do a water warm up, technical session and a few race pieces to finish. Once we’ve packed the boats away, we warm down and have tea & cake. We’re a pretty friendly lot so that’s a great opportunity to get to know the team and get a feel for the club. We provide all the equipment you need to get you started. Will I get wet? Probably! Dragon boat racing is a water sport, therefore, its highly likely that you will get splashed. Bring a spare set of clothes and a towel. We have changing rooms and showers on site and there’s always a brew waiting for you at the end of training to warm you up! What should I wear or bring? Work out clothes you don’t mind getting wet, old trainers or boat shoes and a waterproof jacket in winter. Bring a water bottle, sun screen, change of clothes, a towel and loose change for tea and cake. Do I have to be super fit? Not at all! When it comes to racing, you’ll need to have a reasonable level of fitness, but stamina is something you’ll build over time when training with the crew. Whatever your level of fitness when you join, we’ll work with you to identify your training goals in a friendly and supportive environment. What does it cost? The first session is free and then we charge £5 a session and you can come to five sessions before joining. Kingston Royals share the facilities with Walbrook Rowing Club, Royal Canoe Club, the Skiff Club and the Outrigger Club. There is an overall site membership fee of £185 which gives you access to the gym and other facilities. In addition Kingston Royals membership fee is £50. This includes all training sessions, coaching and O1 use, but not race fees. When you start racing you will have to join the British Dragon Boat Association.